More than three quarters of people with dementia who receive social care support at home are not using direct payments or other personal budgets despite government plans to roll them out to all people using social care services, according to a new Alzheimer’s Society report ‘Getting personal? 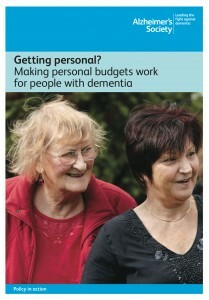 Making personal budgets work for people with dementia’. The report is based on a survey of 1,432 people with dementia and carers living in the community. The report suggests that around 300,000 people with dementia living in the community are currently in receipt of social care services for help with things such as eating meals, washing or going to the toilet. Yet less than 40 per cent have been offered a direct payment or other personal budget. Fifteen per cent of those offered them turned them down. ‘Getting Personal?’ suggests that personal budgets, specifically direct payments can bring real benefits for people with dementia and their carers, with those using them found to be more likely to be satisfied with the services they received. It also enabled the user to purchase services such as support with cleaning, gardening and for holidays which they may otherwise not have been able to afford. Strict criteria which means many people with dementia are not eligible for social care services until crisis point, by which point personal budgets may no longer be an option.